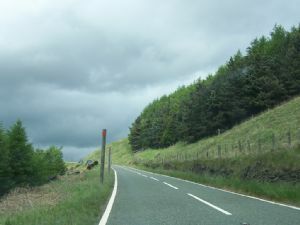 A big thank you to Chris Marshall of CBRD, who sent me these pictures of the A6024, which runs between the A628 and Holmebridge, near Holmfirth, across Heyden Moor. To find the road on a map, please click here. I think these pictures date from the same day that Chris took the pictures in his Scammonden Bridge album on CBRD. Well worth a look! 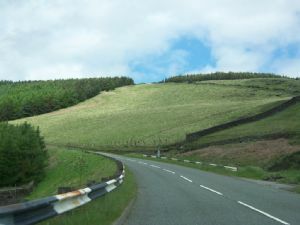 The pictures run from south to north, starting at a slight dip in the A6024 a few hundred yards north of its junction with the A628 next to Woodhead Reservoir. 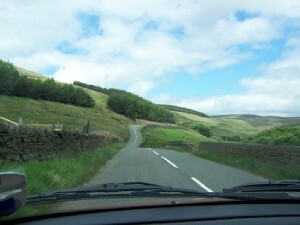 The open nature of the countryside gives us a clue as to how the road will develop over the miles to Holmfirth. 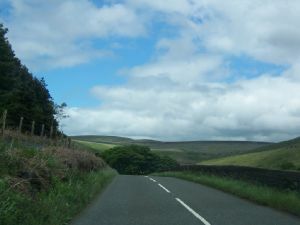 It has been pointed out to me that many people know this road as Holme Moss rather than Heyden Moor. I now use both on this site so please forgive me if I've got it wrong in some places. We continue through a slightly wooded area, until a grassy hillside emerges through the trees. 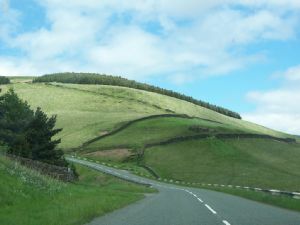 Every time I look at this picture, I am struck by how green and smooth the hill looks. 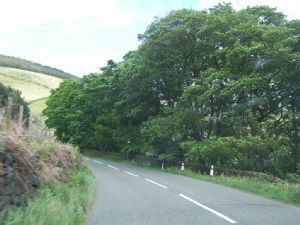 The turning to the left in the next picture is taken near Heyden Bridge, just before the road goes round a sweeping bend to the left. 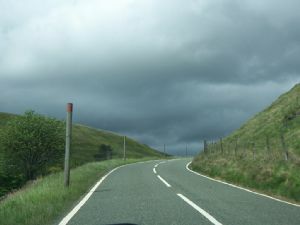 The black-and-white-painted safety fence helps to define the route of the road over the next stretch. Just been reading the article on the A6024 - I know very well. In the stretch soon after leaving Woodhead he comments about the black and white safety fence. If he'd stopped and looked down into the valley on his left he'd have seen the little bridge remains that showed the original (until 1960s/70s) alignment of this part of the road. Before realignment the road went down into this small valley and rose out with a hairpin left to join the present road's alignment. I remember that hairpin VERY well as, on Friday 4th September 1964 (it was the Friday immediately prior to the 1964 Denby Dale Pie weekend, hence accuracy of the date) I was riding my Vespa scooter, suitcase fastened to rear carrier, over to near Denby Dale to stay with an aunt for the weekend. As I negotiated that hairpin, being left-handed the incline on the inside was VERY steep and the front wheel of my Vespa came off the ground, the suitcase upsetting the CoG. Fortunately I was able to lean forwards and upwards and brought the front wheel back down again. The thought of doing a back somersault did not appeal. 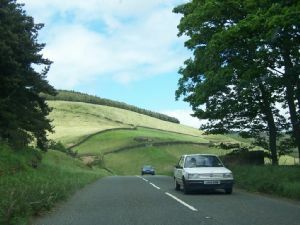 Now we emerge from the trees and begin to climb steeply onto Heyden Moor (or should that be Holme Moss?). Notice the high marker posts, which are presumably there to define the line of the road in snowy conditions.